Pot roast is one of my favorite things to make on Sundays or for big family gatherings. It makes the house smell amazing as it cooks away and really is a comfort food! 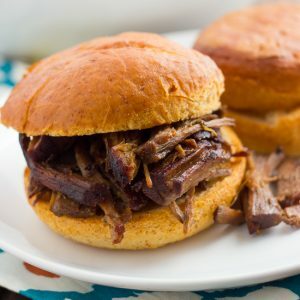 I have made this pot roast dozens of times and it has become kind of famous among-st my friends and family! I love this recipe because it is basically fool-proof, and the meat turns out melt-in-your-mouth tender every time. The gravy is also full of flavor! If you are nervous about porcini mushrooms or don’t think you like them, don’t worry. They get pureed up into the gravy and give the sauce a wonderful depth of flavor. Nobody can ever guess they are the secret ingredient! I like porcini mushrooms best, but you can use any kind of dried mushrooms you can find. I often add yukon gold potatoes and chopped carrots to this about 1 1/2 hours before it’s done cooking. I just add them right on top of the meat. Then when the meat is done, you have an entire meal! This is also delicious over mashed potatoes, polenta, or buttered noodles. 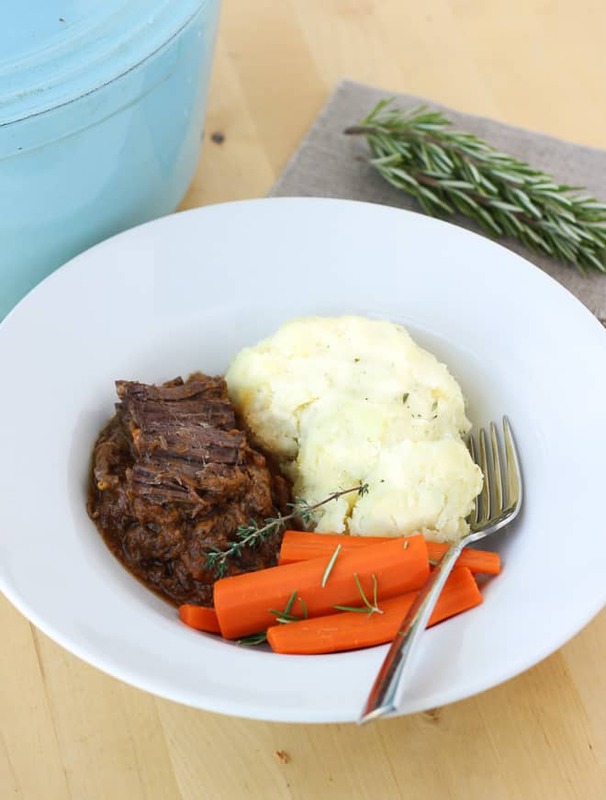 This pot roast makes a great holiday meal! Pat the beef dry with paper towels and season with salt and pepper. 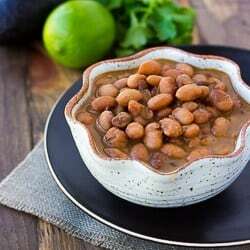 Heat 2 tablespoons of olive oil in a large dutch oven or heavy-bottomed pan over medium-high heat. Add the beef and cook until browned on all sides, about 10-15 minutes. Remove the beef from the dutch oven and place it in the slow-cooker. Add the onions, carrots, and celery to the now empty dutch oven and cook until tender, about 6-8 minutes. Add the garlic, rosemary, and thyme and cook for another 30 seconds. Pour in the wine and scrap up all the browned bits from the bottom of the pan (all the flavor!). Allow the wine to cook and reduce for 5 minutes. Pour the wine/vegetable mixture over the beef in the slow-cooker. Add the porcicni mushrooms, bay leaves, and beef broth. Cook on low for 6-8 hours or on high for 3-4 hours. After the roast is done cooking, remove the meat from the dutch oven and place it on a serving platter tented with foil. Remove and discard the rosemary sprigs, thyme sprigs, and bay leaves. Skim as much fat as you can off the surface of the remaining liquid. Pour the liquid, including all the vegetables, into a blender and blend until smooth. Slice or shred the meat and pour over the gravy. Serve, passing the remaining gravy. Enjoy! *I often add yukon gold potatoes potatoes and carrots chunks to this about 1 1/2 hours (or 1 hour if you’re cooking it on high/in the oven) before the roast is supposed to be done cooking. Just add them right on top of everything. *While I like porcini best, you can use any dried mushrooms you like. Trader Joe’s sells a package of a mixed variety of mushrooms that will work. *To make this in the oven, place everything in a large dutch oven and bake at 350 for about 3 hours. Then proceed with making the gravy. 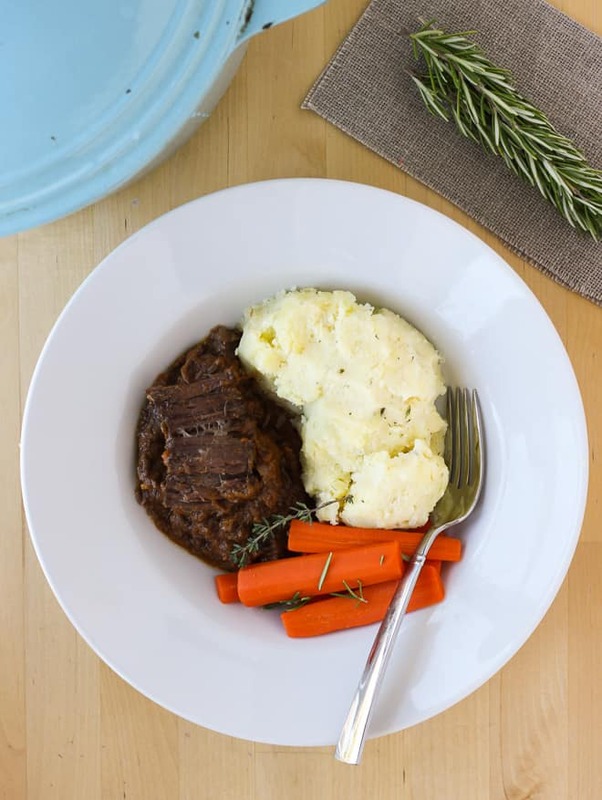 I found this recipe on Foodgawker and it fit the bill — simple, slow-cooker pot roast — and I made it tonight. Outstanding!! Excellent taste and very easy to make. I used a 4lb grass fed chuck roast from a local ranch. I’ll be checking back into your website for more ideas. I’m so happy to hear that! Glad you liked it. I’m so glad it turned out for you! I’ve never reviewed a recipe before but this one was so good that I just wanted to thank you. This recipe was so easy to prepare and my family just loved it. I love the fact that the gravy was naturally thickened just by sticking it in the blender. I didn’t have a 4lb roast as was suggested. I had a 2lb chuck so I just cooked it on low for a little under 8 hours. Once again thanks for a great recipe. This was SO good. Made it along with the Gluten Free Peach & Blueberry Cobbler tonight. Such a fantastic Sunday Dinner. Both were easy recipes to follow and turned out beautiful. I made this yesterday for friends and it was a huge hit. Dried mushrooms are not available where I live, so I used a can of mushrooms, drained, and added them 2 hours before the end of cooking. The gravy is so flavourful, the beef so tender. This has now become my go to recipe for doing roast beef. Thanks Mel! I’m glad you liked it! I made this recipe for my book club last fall and it was a huge hit!! I was kicking myself because I couldn’t find the recipe last night and I really wanted to make it again. Luckily, I went all the way back in to my search history and was able to pull it up. But THAT’S how good it was! Simple, healthy, and delicious. Thank you!